View more Burl Textures in our Gallery! Contact us today to request samples of our Burl Textures line. Samples include our most popular textures on a variety of substrates. This is the original Dichrolam line of laminates that made the Material ConneXion library's top ten list back in 2000 (Black Sea). 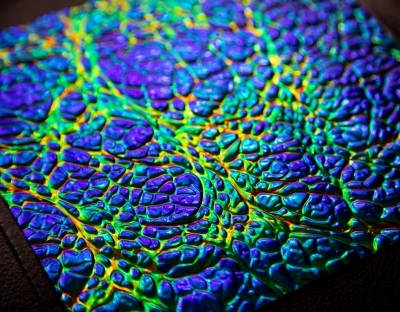 These laminates are random, three dimensional textured patterns that look like a cross between Carpathian Elm Burl and Australian Black Opal. During patterning, color combinations are revealed that previously did not exist in the core film. And, unlike vapor deposition dichroic glass, they are streaked with veins of complementary color. Between the veins are what we call the "coral heads" which makeup the literal topography, containing the furrows of contrasting color that took John years to pattern and control. Although the Burls appear metallic, they have no metal in them at all. The reflectivity comes from the dichroic nature of the core film in which light wavelengths that are in phase with the tuned "stack" pass through and the wavelengths that are out of phase reflect back like polished metal. By themselves, the patterned films are amazing, but when laminated they "wet out" with the resin the way a finish makes grain jump out in wood, while creating a depth magnifier that gives the lens effect of mile deep texture. Applications range from five figure guitar faces to interior trim banding all the way to heavy glass like bar tops and the seventeen foot conference table for MTV. 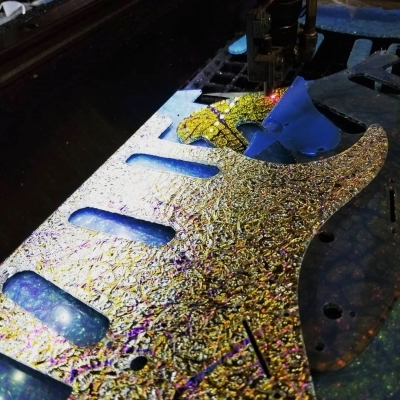 Originally only made in glass, these exotic laminates are also made in laserable acrylic and thin ARPET as well as rigid luthier grade inlay stock by Tom Schotland and Chuck Erikson of Duke of Pearl for top guitar companies like Fender CS, Martin, Taylor, PRS and Jens Ritter to name a few. Each color in the Burl line requires a completely different technique to pattern in order to bring out the most aesthetic pattern and color veining. Red Burl, for example, was made with black veining for about four years before John figured out how to bring out the blue violet streaking between the rich copper red coral heads. The Titanium Burl is even more difficult to achieve the rich magentas blues and golds. Using several different polymer systems these burls can be laminated in glass or laserable composites of acrylic, PET and other proprietary resins for rigid and formable sheets. 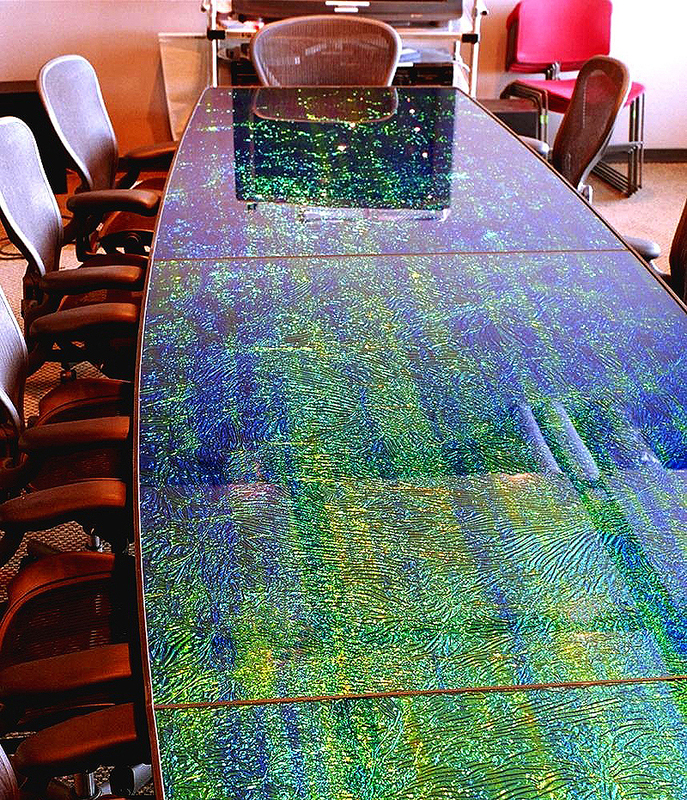 Panels in glass and acrylic as large as four feet by ten feet long can be made, but most panels are done in 24 x 48 and usually custom sized for the specific job at hand based on cut list. Black Sea: Deep blues, greens and violets interstreaked with gold to red veining. The dichroic color shifts from blue green at right angle viewing to deep purple and violet at skewed angles. Red Burl: Rich Reds with gold and copper highlights, interstreaked with dark violet and blue veining with occasional green highlights. The dichroic color shifts from red / gold at right angle viewing to green / gold at skewed angles. Green Burl: Bright gold green with black to violet veining. 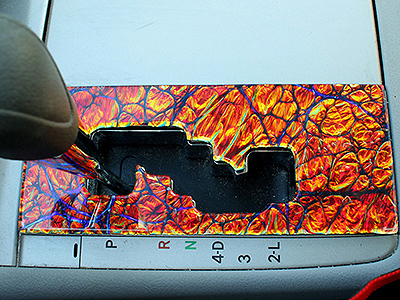 The dichroic color shifts from the gold green at right angle viewing to rich blue at skewed angles, while the black veining actually turns copper red. Fire Burl: Literally every color of the rainbow with gold, copper and fuschia thrown in. Primary coral heads are red/gold like Red Burl, but the veining has it all - blue, purple, violet, magenta green and yellow. The dichroic color shifts into the blue end of the spectrum as viewing angle decreases. White Burl: The very expensive core film appears like aluminum foil, hence the white coral heads, but the veining is gold and magenta mixed with the elusive sky blue streaking. The dichroic color in the veining shifts in an interesting way: blue shifts into magenta, and magenta shifts into gold. Titanium Burl: Insane example of push-processing using the basis of White Burl, but strange steps are taken to create huge veins of rich sky blue and magenta amidst pure gold coral heads. The same colors found when heating titanium to bring out its oxide colors. The dichroic color shifts as follows: Gold goes white, blue shifts into magenta, and magenta shifts into gold. Tempered Glass in the range of 1/4" to 3/8" is ideal for table tops and bar tops, while annealed glass is fine for tile and vertical applications. 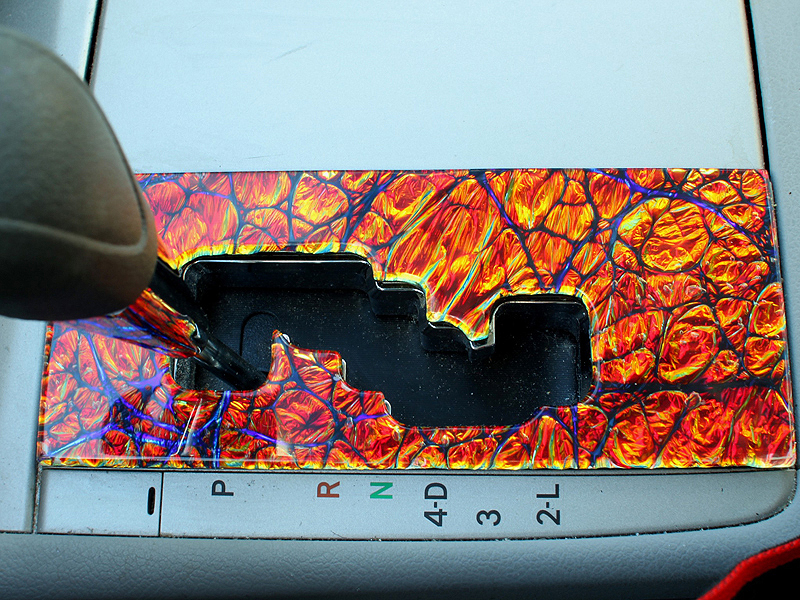 Cell phone covers, accent trim / frame banding and control / cabinet knobs are best in acrylic or ARPET which can be lasered to fine detail and sizes. All of our products are custom made and can be applied to a number of substrates. Please feel free to contact us to discuss your specific project needs.